Derek Lam gives us a preview of the models of its beautiful collection of shoes Resort 2013, allowing us to take a look at trends that will mark the next hot season. According to the previews for 2013 we are looking at these days, a trend that we find is that of reptile prints, must have already this summer and apparently, a great protagonist of the new collections. Derek Lam on the other hand loves to always add an ethnic touch to his creations, be it shoes or accessories, let's see what he made up for next year. In his new line of sandals, Derek Lam fits models with heel and pyramid plateau outward, as the fashions they want the last hour. We speak of beautiful open-toe models feature an upper asymmetric shape, with open instep and leather straps that go up to embrace her ankle, entered into by and adjustable gold buckle. The most striking feature is the beautiful reptile print in shades of black and white polka dot effect, fantasy exploited among other things, for the variant with flat thongs very peculiar and intricate lists. Derek Lam sandals are also available in the finest leather versions, available in shades such as caramel, white and black forever, covered heel. Something special is also consistent with the giraffe print, which offers models with high heel and platform versions but also flat cage ethnic flair and daring. Even the line of pumps and decolletes Derek Lam uses patterns and shapes very eccentric. 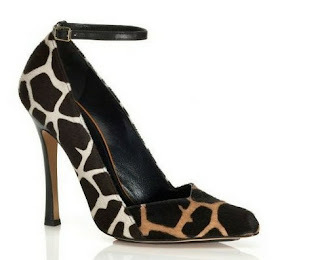 Just like the sandals, mary jane high heels will print and giraffe in shades of brown, beige and white ankle strap and heel covered in leather, but also models a narrow point of asymmetrical upper complemented with reptile print with polka dots blacks and whites. Back to the protagonist of the upcoming 2013 season hot denim, almost in contrast with the more chic and sophisticated style pursued by Derek Lam with other models in the line. You will experience heel sandals with wooden pyramid plateau and outside and cut, shape, alternating bands of black denim and leather bands, or in total denim with lists and braided instep strap.